It’s a dream of many to live on an island paradise. For a few this became reality when a of team of ocean lovers got together and created the Sulubaaï Foundation. Based on Pangatalan Island, shown above, this is where Fred Tardieu and his wife Chris live and work – protecting the island and surrounding area together, along with their colleagues and visitors. Their projects include: coral reef restoration, mangrove regrowth, re-vegetation of the island, education for local communities and schools, marine science courses and volunteer stays. But even projects of vision require electricity. More of that in a moment, but first a little background. 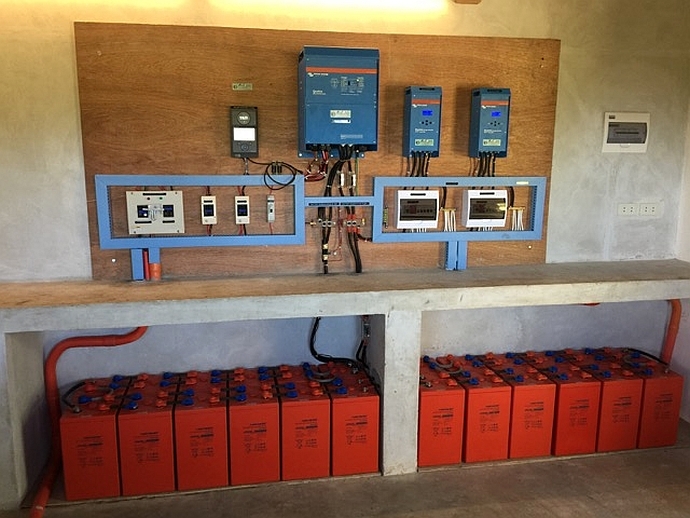 Knowing that the island had recently installed Victron Energy products with remote management, the first and obvious place to look was VRM World. It didn’t show up, as of course VRM sites can choose to share their energy data or not, so I had to look further. It turns out that Pangatalan Island is located on the northeast coast of the Province of Palawan in the Philippines, within the Shark Fin Bay area of the Sulu Sea, which incidentally is who the Star Trek character Hikaru Sulu is named after. Please note I might be geeky, but I’m not a Trekkie – just thought that fact might interest some! Sulubaaï is a combination of Sulu Sea and the word bahay, which is the Filipino word for house or home. 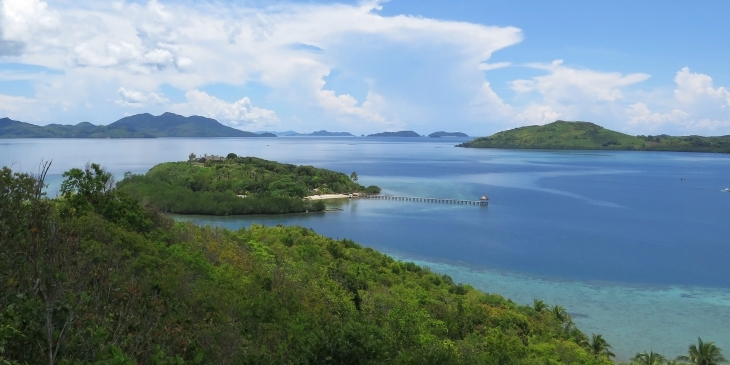 Since Fred and Chris bought Pangatalan Island in 2011 and established their foundation, they promised themselves to save and protect it – making the island their ‘home in the Sulu Sea’. Even off-grid visionaries require electricity and so it came to be that Fred Tardieu and his wife Chris contacted Josie and Koos Mulder of JK Solar Power House. Together with Danny Maesen of PhilSolar Equipment and Trading Corporation they organised, planned and installed a solar system with generator backup. As the project is in a Marine Protected Area (MPA), this initial phase has been planned in such a way that the system can be upgraded to more and more solar and inverter power, in order that the use of the diesel generator can be kept to a minimum, or indeed eliminated altogether. Whilst Victron Energy can supply most if not all components for off-grid systems, diesel generators are an exception! Having said that we often find in far flung places that installers and suppliers may also, for all sorts of reasons, choose to mix and match components from various companies. Fortunately this is not an issue, as Victron products integrate very well with products from other manufacturers. And so it was in this case. A schematic of the initial system is shown below. The completed installation using these products is shown below. No matter where you are in the world Victron Energy products (whether used exclusively or integrated with products from other manufacturers) can solve your off-grid challenges. 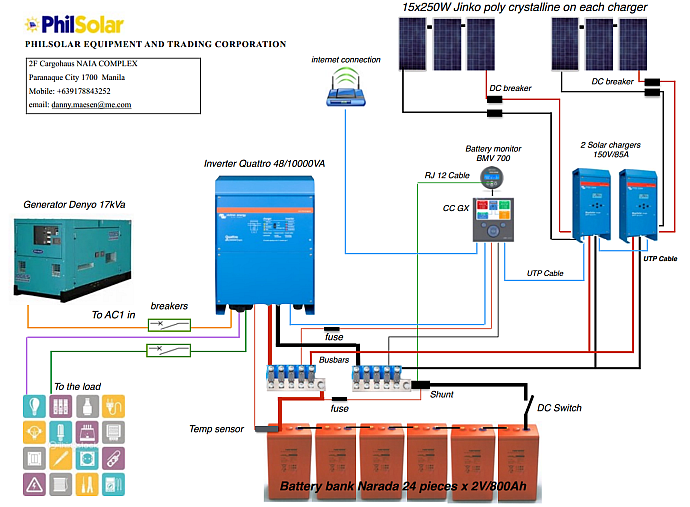 In this case that included collaboration between JK Solar Power House and PhilSolar Equipment and Trading Corporation, in order to meet the Sulubaaï Foundation’s needs. My thanks to all the parties mentioned above for the information and images used in this blog.